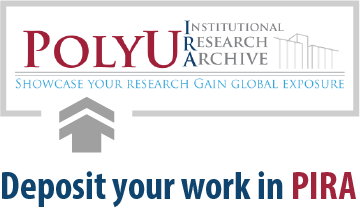 This guide introduces key features of the PolyU Institutional Research Archive. Metadata will be made public; full-text will be openly accessible in accordance with publishers' self-archiving policies. PIRA welcomes requests to add non-traditional research output to showcase your research. Complete the Deposit Agreement Form. Save the Deposit Agreement Form together with the files to be uploaded to PIRA. Email all the files to PIRA staff or Upload to OneDrive and share with library.ira@polyu.edu.hk. For more details, please see FAQ. There are many places where you can share your works, either through an institutional repository like PIRA, or a scholarly social media platform such as ResearchGate. Here are a few tips for you before you share your works online. Publishers usually make distinctions between three primary versions of a manuscript: the Pre-Print, the Post-Print and the Published version. Pre-Print is the original manuscript the authors submitted to the journal. Post-Print, or "final accepted manuscript", is the version that has gone through the peer review, accepted by the journal, but not yet copy-edited. Published version is the final formatted version that can be seen on publisher's site. Different publishers may adopt different copyright and self-archiving policies. Many publishers allow authors to archive the Post-Print in an institutional repository, but may subject to an embargo period. Most publishers DO NOT allow sharing the published version online (except for those published in OA journals). As an author, you will benefit from sharing the appropriate version of your work. You do not need to worry about the citations – they are always attributed to the published version of your work. PIRA (PolyU Institutional Research Archive) is the institutional repository of PolyU. Upload your works into PIRA makes your research works permanently archived. Your publications will also become more visible and discoverable through Google and Google Scholar since everyone can view your work without subscription paywall. PIRA accepts the deposit of Post-Print (or final accepted manuscript). 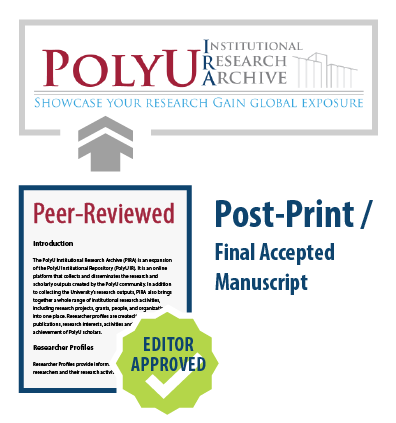 To upload your works in PIRA, you can simply send your final accepted manuscripts to the Library by emailing library.ira@polyu.edu.hk. The PIRA team will help you check and ensure that the appropriate version of the work is made available online at the right time in accordance to the publishers’ policy for self-archiving. 3. Send manuscript as soon as it is accepted before you forget! If you wish to share your works in PIRA, make sure to send over the manuscript as soon as the paper gets accepted. This is because many people will not be able to locate this version after the final published version is online.